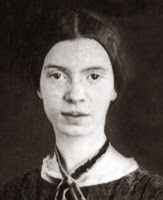 "I could suffice for Him, I knew (643)" by Emily Dickinson (1830 - 1886) (pictured) was offered by Poets.org's Poem-A-Day on August 3, 2013. A link to the poem may be found here: http://www.poets.org/poetsorg/poem/i-could-suffice-him-i-knew-643. The message of the poem seems to be that the poet cannot help but behave in a way that would be pleasing to God (any more than the tides could behave differently when acted upon by the moon). What struck me most about this poem by so famous a poet was its awkward quality. Forced rhymes abound; at one point, "unto" is used to rhyme with "unto." And is "audibler" even a word? My spellchecker certainly does not recognize it. Well, I suppose Ms. Dickinson is entitled to a little poetic license.